Juneau, Alaska - Former Fairbanks Mayor Jim Hayes and his wife were indicted by a federal grand jury Wednesday for embezzling more than $450,000 in government grants. A 92-count indictment says the couple spent government funds on a plasma TV for the couple's home, a trip to London, a family wedding reception, construction of a new church for Hayes and to cover personal bills. The couple face multiple charges, including conspiracy, embezzlement, money laundering and misuse of government funds. 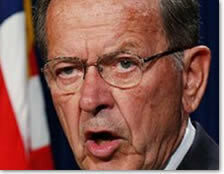 The grants came at the direction of Senator Ted Stevens the Fairbanks Daily News-Miner reported last year. Hayes' son worked for Stevens at the time and lived in Stevens' home. The indictment says that, Jim Hayes' wife, Chris, had her organization write checks for cash that she then used to purchase money orders and cashier's checks.